Once the first person disappeared over the edge of the cliff, there was no turning back. It had been raining all morning and the slippery conditions, as well as low water levels, had put doubts in some of our minds if it was actually safe to continue Suicide Gorge, a ravine that’s known for its high cliff jumps, about fifteen in all. Nevertheless, without a word of warning and little fuss, Reuben launched himself off the rocky platform into the pool five metres below. And that was that. Suicide Gorge lies in the Hottentot Holland Nature Reserve a little over an hour from Cape Town near Elgin. There are three legs to the hike. First, there is a 2.5-hour hike from your car to the start of the gorge. Then there is the cliff-jumping adventure down the gorge, followed by a hike back to your car. It’s recommended to pack a wetsuit in your backpack for the possibly cold water and to slide easier along the river. In thick cloud and misty rain, we had walked briskly and eagerly to the starting point. Those with an uneasiness about heights initially hung back (me) but once Reuben went over, there was only one way we were all getting down that mountain. Wetsuits on, clothes in the bag, look once and jump. The first jump was not too high but we knew it was only going to get bigger from there. The biggest one is 14 metres, but there are a few about that size. Surprisingly, though, it only got easier. With every jump, drawing on the bravado of the group, I grew in confidence and by the time we reached our biggest jumps I was calm and composed and loving it. We slid down algae-covered rocks, dragged ourselves along the flat portions of the river like crocodiles and progressed from pin drops to back flips almost immediately. 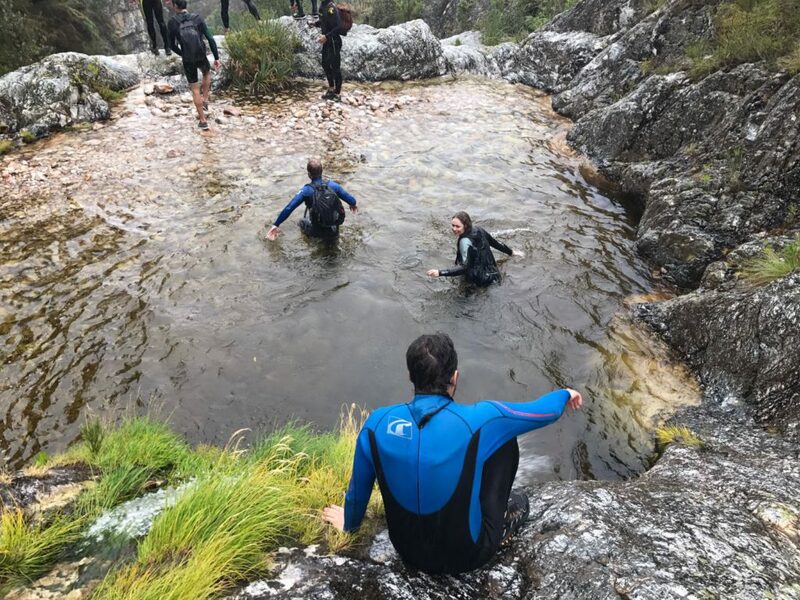 The sense of exploration mixed with the adrenaline from the jumps, as well as how beautiful the gorge is, means this hike is one of the best and most exhilarating day hikes in the country. It’s funny to call it Suicide Gorge (suppose that’s what it sometimes feeling like you’re doing) because it makes one feel so completely alive. After three hours of making our way slowly down the gorge, we reached the end point. We climbed out of our wetsuits into sopping wet clothes and made the two-hour hike back to the car. I wasn’t able to take my camera with due to the nature of the hike, but Instagram has stepped up to the plate beautifully. A video and vital hike information are at the bottom of the post. Leave Cape Town early. If you go in summer, you can get nailed by the sun especially on the final leg back that has little shade. Take a lunch and eat it once you reach the top of the gorge. Sandwiches are better when they’re not soaked with river water. On that note; everything will get wet. Everything. So pack accordingly. Leave a towel and a change of clothes in your car. Be careful! And check out every jump and landing before you go. Water levels fluctuate and in low water, some jumps will have to be bypassed. Remember, you’re a long way from help. Enjoy it! You’ll be sad when you reach the end. Please only do this hike if you are a fit and experienced hiker. It is advised to go with someone who has done this hike before. The route can be dangerous in extreme weather conditions. excursions on Saturdays and Sundays must be booked a month in advance. A shorter booking period is allowed for weekday excursions.